It had been a long time since I’d last visited Kruger and at least two decades since the whole family could join. But this year we somehow got everyone together for a long-planned dream road trip from the south to the north. Our first night was at Skukuza, which I’d last seen in the ’90s and my take away memory was that it had been a bit overcrowded and loud. Either my memory is faulty or that was just a bad weekend; when we braaied that Saturday you could hear a pin drop. Around the fire we discussed our week’s route (in very hushed voices, needless to say): a few days in Letaba, then up to Shingwedzi – a 7-day road trip before the long haul back home. When you’re stopping for animals it means long days in the car and my mum and aunt in particular were keen on lots of breaks. We had no fixed plan as we left Skukuza the next morning, but the lookout at Orpen Dam seemed a likely first stop. 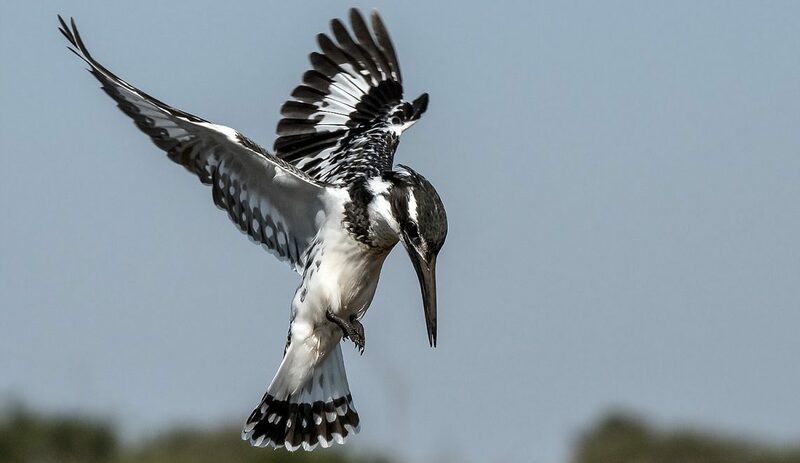 Kruger Park’s website lists 17 public picnic spots, plus 11 bird hides and half a dozen great lookouts – all designated areas where leaving your vehicle is allowed. Orpen Dam is one of these excellent lookouts, about 15 minutes east of Tshokwane Picnic Site, on a high vantage above the Nwaswitsonto River. Orpen Dam viewpoint. Photo by Chris Davies. Tshokwane is one of Kruger’s largest picnic spots, with a shop, gas braais and ablution facilities. Orpen Dam is much smaller, with no facilities at all. It’s just a thatched, open boma, but has far better views. Within minutes of our arrival a herd of elephants strolled in and we watched them for half an hour as they got stroppy with some buffalo. A young bull wanted his usual mud bathing spot and some vigorous trumpeting was required to get the old dagga boys to move off. From high up on the clifftop we watched the minor turf tussle evolve: the buffalo nonchalantly made way and the young bull soon got his bath. After a fantastic wild dog sighting on the Olifants–Satara Road, we took an afternoon detour down the Olifants River itself. 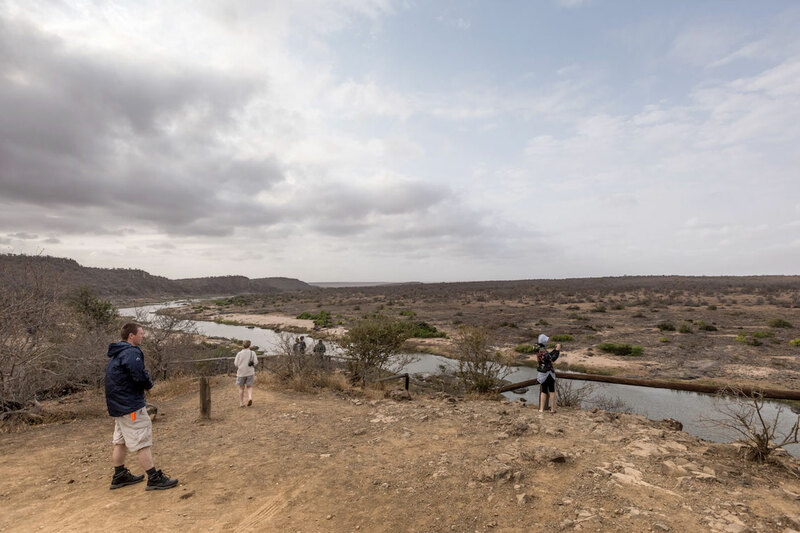 Olifants Camp has arguably the best viewpoint in the park, but after a quick rest stop we pushed on to the river viewpoint further east. Olifants River viewpoint. Photo by Chris Davies. It was an overcast afternoon and beside the wild dogs we’d seen little, but still the view over the river was well worth the drive. While the rest camp had been busy, the small river viewpoint was serene – just a few cold looking crocs on the sandbar below. 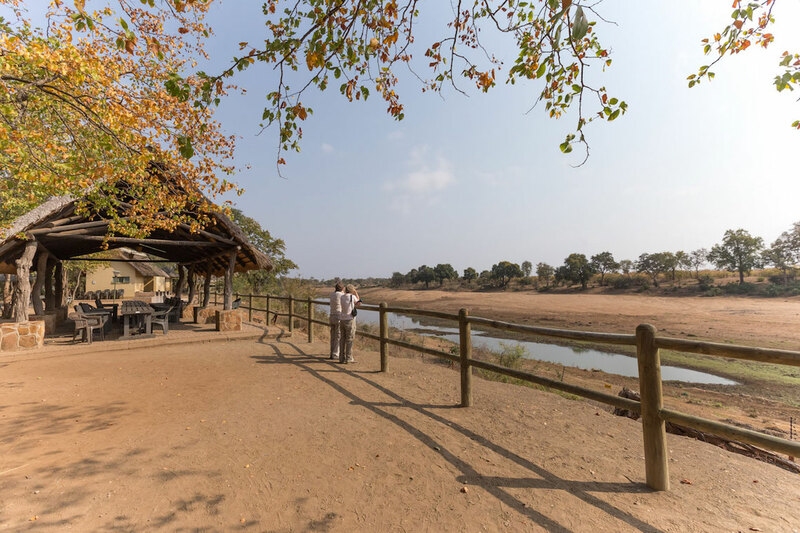 While there are no facilities at all (not even any shade), Olifants Rest Camp is not far, only 20 minutes up the road. 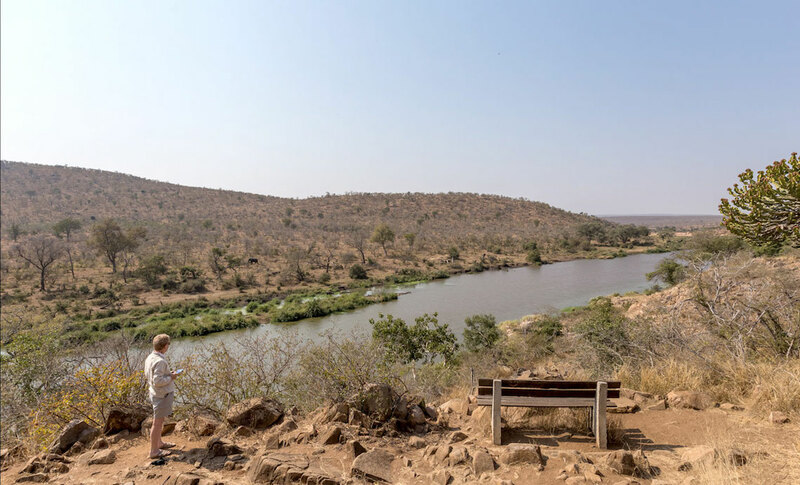 The river viewpoint makes a lovely break on the S44 loop, which takes in the Olifants and Great Letaba rivers. After another hour’s drive, we arrived in Letaba, but with sunset approaching made a quick dart for the bridge. On Kruger’s wider bridges you’re allowed to leave your vehicle and the Great Letaba River curves due east just here. In early August, when we visited, the sun sets well before the gate closing time of 6pm and it’s only a 10-minute drive from the bridge to Letaba Rest Camp. The view down the river is nothing short of stunning and we could have sworn we saw two lions disappearing in the twilight. We spent two glorious days relaxing in Letaba, enjoying the suddenly hot weather and making regular use of the pool. An afternoon drive to Matambeni Bird Hide produced some lovely hippo sightings, but alas not many birds. Although quite low to the river, Matambeni has an excellent view, a 360° panorama along the Engelhard Dam. It’s a bit of a detour on a dead-end track, but a worthwhile stop if you’re on the S62. We left Letaba under heavy clouds again and decided to try Mopani Rest Camp for a warming mug of coffee. Mooiplaas Picnic Site is another good option nearby, but despite their gas braais and clean ablutions we felt like something cosier. Mopani Rest Camp. Photo by Chris Davies. It’s a very long time since I’d been to Mopani and I have to say I was extremely impressed. Wonderful viewing decks run along Pioneer Dam’s eastern shore and there’s a lovely little restaurant/coffee bar with beautiful views. A pity our weather was not playing ball, but we lingered anyway, over one coffee then two. Our last camp was Shingwedzi and the drive north was quiet. The cool, cloudy weather seemed to have most of the game hunkered down. When we arrived in camp we found the reception lined with awards – accolades for best rest camp alongside dramatic photos of the 2013 floods. It’s remarkable how Shingwedzi has been able to rebuild after such a disaster and in a week of friendly welcomes it was the warmest welcome yet. Shingwedzi Rest Camp day visitors area. Photo by Chris Davies. I was also thoroughly impressed with their day visitors’ area, which was scrupulously clean and has great river views. The bridge over the Shingwedzi River is another spot to stretch your legs and as the clouds cleared in the late afternoon we were treated to a glorious sunset down the dry, giraffe-filled riverbed. What are your favourite places to stop in Kruger? In the comments below, let us know which spots you rate for a padkos pit stop or as a place to stretch your legs. The Pafuri picnic site in the north of the park is my favorite place to stop. 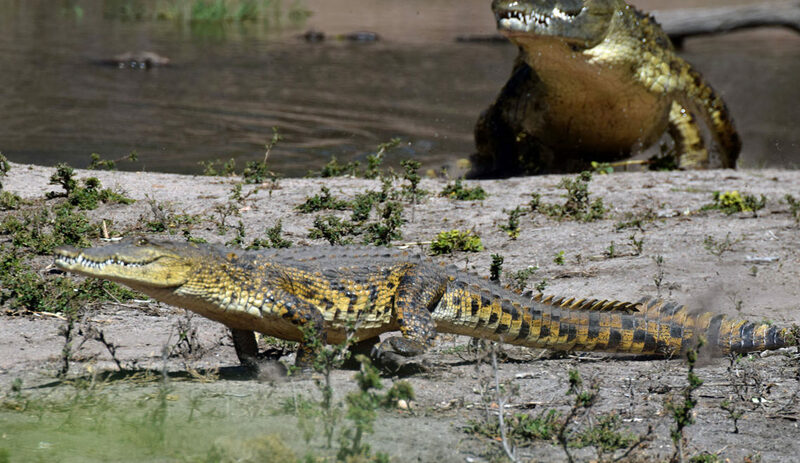 It is on the Luvuvhu river and is set between huge Ana trees and thick bush. You can’t say that you’ve truly experienced the Kruger National Park if you’ve not spent time at the picnic spots in the park. I’ve been to all of them as preparing a brunch at one of these facilities is an integral part of our day’s activities when visiting the park every year. It is simply an amazing experience to be able to take a breather from your morning’s game viewing drive and prepare your favourite breakfast/brunch – in the bush! The skottel braais that you can hire at these spots makes this a very clean and easy exercise. There are also various picturesque spots, like Pafuri, N’wanetsi, Mlondozi and Orpen Dam where the amazing views enrich the experience of having a meal out in nature. Mooiplaas, Shingwedzi and Timbavati is simply classic “Wildtuin” experience and Babalala is great – just because it is Babalala! The most memorable however, and the ones we enjoy visiting the most, are the ones that are literally in the middle of nowhere – Muzandzeni, Nhlanguleni and Makhadzi. This is where everything culminates into you really experiencing what its like to be a part of nature. 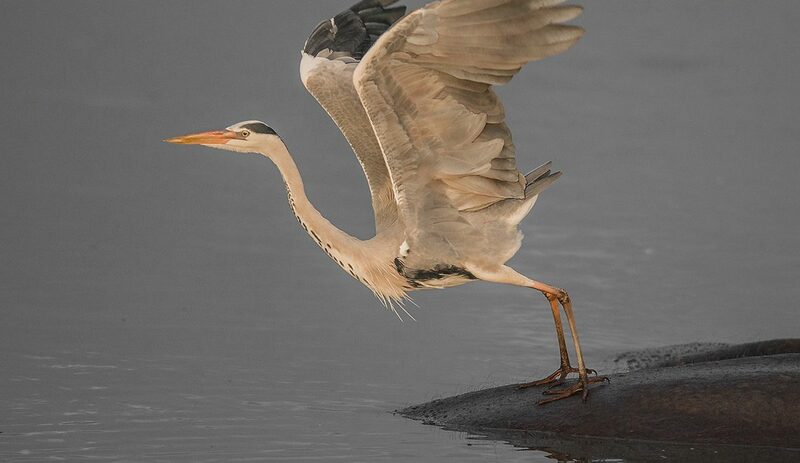 If you haven’t been to these spots, you won’t know what the Kruger National Park is all about. There also has to be a sad part to the story, and this is the falling into ruins of the absolutely devine picnic spot at the day visitors area, set up a few kilometres from the Berg-en-Dal rest camp on the tar road from Malelane gate. This all because of an inability to resolve differences with the local tribes and communities. This was always one of our favourite spots and hopefully the issues can be resolved and the spot restored to its previous splendour. So enjoy Nhlanguleni as we have never had tour operators there. A spectacular water hole so busy. The last 2 years we have even had leopard sightings late morning during our breakfast feast. Do not forget Lake Panic near Skukuza!